Hi everyone. Sorry it's taken me so long to post. The day we arrived in Hawaii we had a huge flood and my MIL's house, where we are staying, got completely flooded. I'll post more about it later. Right now I'm just happy to set up this giveaway to distract me from the craziness. The funk and funky Etsy shop DanzDzynes is giving away one Junk Food Jewelry to a lucky reader. check out these cupcakes! Yum!!!! The best part is that you can choose which ornament you want and also the scent that you like. Visit the DanzDzynes shop and come back here to tell us which Scented Junk Food Jewelry is your favorite. If you win you get the piece you commented about by Tuesday December 23rd. One comment will be chosen at random. What a cute shop! I love the scented peanut butter and jelly charm. Grilled cheese all the way! The Scented Belgian Waffle Charm is so cute! These are too cool! I'm going to have to figure out which one my daughter would love the most and get her one. My favorite is the peanut butter and jelly sandwich. Thanks! Scented Pancake Charm with scented maple syrup scent..yum. Scented Devils Food Cake Charm is cool. I would love to win the Scented Pancakes Charm! Please enter me & Thanks for the giveaway! Everything is so adorable, I'd pick the cupcake charm in strawberry scented with Wedding Cake. I love the pancakes charm!! Pancakes with Canadian maple syrup.I am a subscriber. so cute!!! love the shop! This is a darling site. I would love to have one of everything. My favorite is the sweet little Itty Bitty Strawberry Sundae Earrings. Thank you for hosting this contest. the scented Yellow Cake Charm is sooooo cute!! Thanks! I love the Scented Peanut Butter and Jelly Charm! Ok...this shop is the CUTEST ever. First of all, I LOVE cupcakes. So, you had me at the cupcake already. Then, I saw the Scented Peanut Butter and Jelly charm. Gotta have that one too...and THEN the Strawberry Pop Tart?? Who knew?? Thanks for an awesome giveaway. I MUST WIN THIS!! 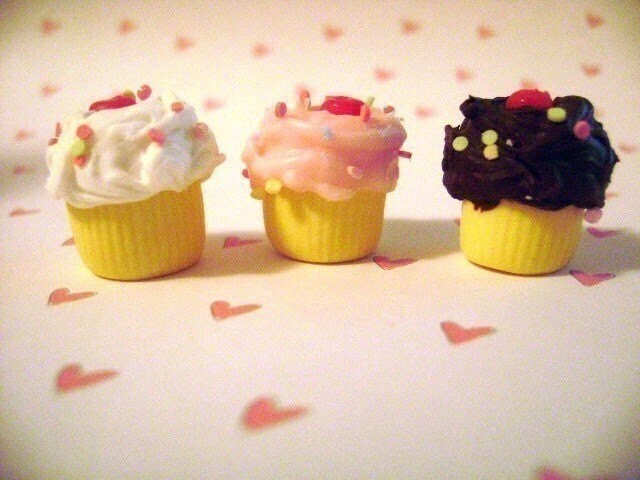 CUpcakes are my absolute favorite thing! I would love the cupcake with the pink frosting in a sugar cookie scent. Yum! Or even gingerbread. I am following you on twitter and just twittered about this contest. I would choose the create your own ice cream scoop charm. Too cute. is my pick and I am sure the girls will start monkeying around to see who can borrow it first from me if I should be lucky enough to win. Good luck to all. Fluffernutters are my secret vice. The Pancakes Charm! How unique. Oooh, nice. I fell in love with scratch and sniff stuff in the 80s and have loved scented stuff ever since. I like the scented bubble gum charm. What a coincidence..I just bought some Brownie bites from Danzdzynes a week ago! But I love the scented PB&J! My favorite is the Itty Bitty Strawberry Sundae Earrings. Thanks for the giveaway! I like Scented Yellow Cake Charm. the Scented Peanut Butter and Jelly Charm is my favorite!! The Scented Carrot Cake Charm will put my husband allover me! Itty Bitty Strawberry Sundae Earrings are so cute. The Itty Bitty Strawberry Sundae Earrings are too cute. I love them! Itty Bitty Strawberry Sundae Earrings are my favourite. 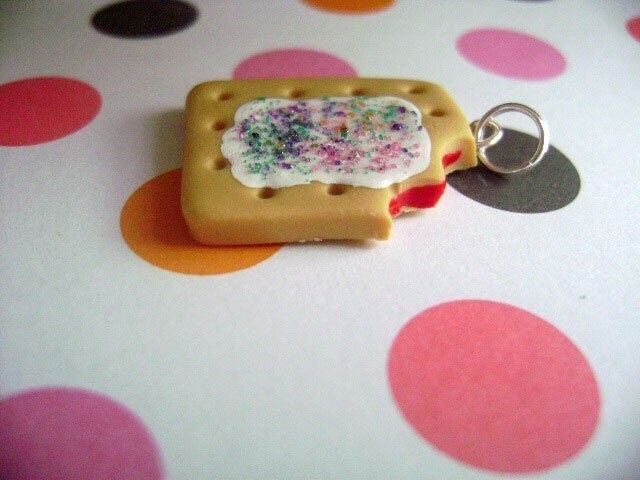 the Scented Strawberry Pop-Tart Charm is so adorable! i love the detail like the little bite taken out of it. I love the I Made You A Sandwich Charm..although each piece is so cute! They all look exactly like miniature versions of the actual foods..amazing!!! What a talent..I certainly could not even remotely make something like that out of clay..! I love the vanilla cupcake charm and I would pick the buttercream frosting as the scent. Thanks! I'd like the scented carrot cake charm for my Mum! This shop just plain rules! If I were the lucky winner, I'd pick the Scented Peanut Butter and Jelly Charm. Such an awesome idea! Thanks so much for the great giveaway! My favorite is Itty Bitty Strawberry Sundae Earrings. I love jewelry like this, it's so fun! I've already bought cake rings and s'more earrings from Etsy. My favorite piece from this shop is the Scented Pancake Charm! I am following this blog with my blogger account!! This is such a hard choice! I am tickled by the cute charms and love them all, but I think the one that is the most "me" is the Scented Carrot Cake charm. I do love the pancakes charm a LOT though. Oh, they all are so darling! I love the Itty Bitty Strawberry Sundae Earnings. The Scented Belgian Waffle for me! Thanks! Scented Strawberry Ice Cream Scoop Charm is berry yummy! POPTARTS!!!! WHOOOOOOOOOO!!! XD this is like a dream come true! I love the cupcake charms - though everything is cute. So realistic! I would like the Scented Cinnamon Bun Charm. What a cute shop! Everthing looks so real and edible and yummy! ^_^ My favorite is the Scented Bubble Gum Charm. I like the scented pumpkin pie charm. I adore the Scented Yellow Cake Charm. I love the Scented Cupcake Charm in Strawberry Cheesecake!